iSpring was started in the early 2000s in Yoshkar-Ola, Russia. We were a small team of young and ambitious programmers with an insatiable desire to raise the bar in software development. Users found our first PowerPoint-to-Flash product really useful. It was built from inspiration, perspiration, and bit of luck - and brought to life by our passion. Later, we developed a whole family of products mostly focused on e-Learning. Users still enjoy our software, and our commitment to excellence continues to be our greatest inspiration, just as it was in our first days. Going far beyond simple converters, our product line today includes powerful tools for creating professional e-Learning courses, and learning platforms for entire organizations. Fully-stocked e-Learning authoring toolkit for PowerPoint. No training required to start! Developing e-Learning content has never been so fast and easy! With iSpring Suite, you can turn your PowerPoint presentations into supercharged e-courses in a snap. Make your learning materials more visual with iSpring e-Learning interactions that you can create fast and easy with iSpring Suite. Use a set of ready-made templates for creating 3D books, timelines, references, glossaries, catalogs, and FAQs. iSpring Suite provides a Character Library for use in your training materials. The library includes characters of different ages and professions in dozens of different poses. You can also create your own characters and add them to the Character Library. iSpring produces content that will work well with virtually any LMS. iSpring tools perfectly support all classic and new e-Learning standards: SCORM 1.2, SCORM 2004, AICC, and xAPI (Tin Can). Everything you create with iSpring Suite supports Flash and HTML5 for perfect playback on any device, including PCs, Macs, tablets, and smartphones (with Windows, iOS, and Android OS). iSpring Suite contains all iSpring authoring capabilities integrated in one supercharged toolkit. With all these features combined in one place, top-to-bottom content creation is faster than ever. Convert PowerPoint to Flash, HTML5, and MP4 video. Create video presentations in PowerPoint fast and easy. Create quizzes and surveys with drag-and-drop interactions. Record all or part of your screen and create video training guides. Build dialog simulations for real-life business conversations. Build interactions like a Book, FAQ, Timeline, and Directory. Experience these demo courses, presentations, assessments and simulations created by our customers using iSpring Suite. Solar System Course Solar System Course. The Anatomy of The Nervous System. How about puzzling out the most complex body’s system? After viewing this cool Anatomy course you’ll learn much more about various vital functions of the Nervous System ranging from muscle coordination to emotional processing. Dialogue Car Car Sale Dialogue. Find out how fast and easy you can create interactive e-Learning courses, video lectures, and assessments with iSpring Suite. Video presentation software for PowerPoint. 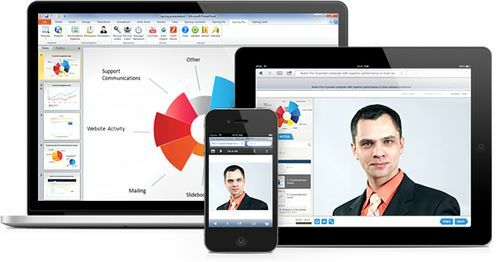 iSpring gives you powerful capabilities to create interactive online presentations. Right in your PowerPoint. Fast and easy. No training required! With iSpring Presenter you can rapidly create interactive presentations in PowerPoint, enhance them with rich media, branch viewing scenarios, add polls and surveys, and immediately share them all worldwide. The easy-to-use video editor helps you add a presenter video and adjust it to your slides. Use your webcam or import a pre-made video file. Engage your audience with rich-media content and interactivity. Share Your Message in One Click! Easily publish your presentation to portable online formats and share it on YouTube, iSpring Cloud, or SharePoint, put it into an LMS, or just host it on your website or blog. iSpring presentation combines your slides and presenter video within a customizable, adaptive player to provide an outstanding user experience that goes far beyond PowerPoint. Add your logo and adjust the player to your corporate style. Swap slides and presenter video on the fly to emphasize the key points of your message. Show and hide, change color and language of every control to your preferences. Choose one of 8 standard layout presets or create your own custom player layout. Use one of 16 standard color presets or create your own. Make your video presentation easy to navigate with a timeline, slide panel, etc. The iSpring adaptive player accurately displays your presentation on desktop computers, laptops, tablets and smartphones with any screen size. 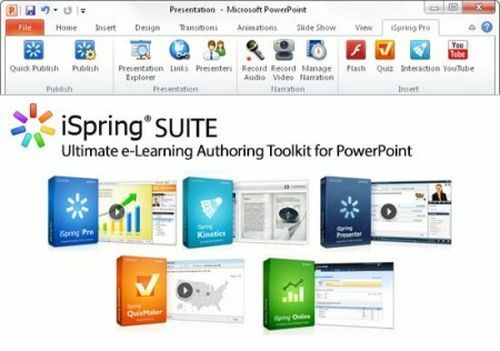 Upload your presentations to iSpring Cloud in one click right from PowerPoint. Immediately share them with your colleagues and customers. Put your presentation on Youtube directly from PowerPoint and make it available to millions on the world"s most popular video hosting site. iSpring video presentations software can be used with virtually all modern Learning Management Systems (LMS) to share your knowledge. Upload your presentation to SharePoint to share with your team and other colleagues in your organization. For techies who know how to use FTP, etc., pring provides the option to upload presentations directly to a website. iSpring Quiz Maker 8 saves you time and lets you create sharp surveys. Powerful and robust, it's amazingly easy to use. Enjoy extensive capabilities for customizing your tests’ style, attributes and personality. Use pre-designed layouts or compose your own. You are in charge: determine all the elements as you like. Design a test using the WYSIWYG Slide View Tool and preview the entire quiz or any specific question. Save time: build quizzes using attractive built-in color palettes or your desired customized colors. Why is iSpring Quiz Maker Preferred? Carefully developed by our first-class team of developers, iSpring Quiz Maker features an easy to use, intuitive interface, while providing an industry leading quiz toolbox. Plus, our renowned conversion engine provides pinpoint accurate reproduction of all effects on any screen and any device. Cover the educational process from top to bottom: deliver and track your content to your learners via any SCORM/AICC/ Tin Can-compliant LMS. Empower your workforce. Conveniently and efficiently train them on-the-go with mobile-ready tests. Launch your market research campaigns and allow your surveysto provide data-rich, real-time feedback. Want to Power-Pack Your Quiz with Rich Media? Spice up your surveys and engage your audience with various forms of media. iSpring Quiz Maker can create audio and video questions, add hyperlinks, and provide images and formulas for both questions and answer choices. Make your quizzes more captivating and engrossing by adding video clips and Flash movies. Include an audio track to a certain question or set a background audio during presentation playback. To illustrate your ideas, add a picture to your test and define its size and position in your layout. Compose formulas in MS Equation Editor and instantly insert them into your quiz. For each question you can set up customized feedback messaging. Reward your e-learners for a correct answer, prompt them to try again, and provide them with more insight that will ultimately lead to the right answer. Creating branching scenarios allows you to arrange personalized e-learner paths within every quiz. Set up different outcomes for each question or answer choice. Identify your learners’ strengths and weaknesses in real time and then channel them to relevant questions or info slides. Send your quiz takers to a specific slide depending on what answer they give to a certain question. If a student answers correctly, you can foster the engagement by asking more challenging questions. Branch questions to info slides to ensure your learners are exposed to more detailed info. For some question types, branching and feedback messages can be set up for each answer choice. Grade your quiz takers fairly and accurately by adjusting your own scoring system. Set up the same scoring rules for the entire test, or, when appropriate, treat each question individually, thereby assessing the question difficulty. Set point- or percentage-based passing scores. Normalizing and baselining quiz scores is always an option. Award points for each respective question and answer choice. Challenge your competitive e-learners! Motivate your learners to answer all questions. Set your rules to deduct points for incorrect and unanswered questions. If your e-learners provide an incomplete or partial answer, you can provide partial credit for their answers. Use testing rules to maximize your test's value. Set up your own custom testing rules to assign a unique value to each test. Tailor your quiz to your wishes and demands. You know best – it’s your test. You can set rules that limit the number of times your e-learners can attempt to answer a question. Jump-start your students' motivation: specify time limits for an entire test or for each question. Create a question pool and present a different subset of questions to each student in your class. You can adjust the options to allow your e-learners to skip questions, or to submit them one at a time for feedback. Thanks to the professional support of e-Learning standards and the community at large, iSpring Quiz Maker tests are easily delivered through any SCORM- or AICC-compliant LMS. You can always choose to publish content via a BlackBoard Building Block or any Tin Can API compatible system. iSpring’s HTML5 technology enables you to create quizzes and surveys for any digital environment including desktops, laptops, tablets, and smartphones. Rest assured that your tests will execute flawless playback and reporting inside any SCORM/AICC compatible LMS. Best-in-class PowerPoint to HTML5, Flash and MP4 video converter. Leading technology for converting .ppt and .pptx presentations, preserving all effects: transitions, animations, and even triggers! iSpring Converter Pro perfectly converts 189 of 199 animations available in PowerPoint 2007/2010/2013. iSpring keeps all standard animation effects, as well as effect combinations, triggers and timings. iSpring Converter Pro supports all 47 transition effects available in PowerPoint 2007/2010/2013. After conversion, all the transitions that you carefully tuned in PowerPoint will work!